A collaborative effort between Citroen, its sister French company Peugeot and Japanese brand Toyota, the Citroen C1 is built alongside its relations on the same production line. A collaborative effort between Citroen, its sister French company Peugeot and Japanese brand Toyota, the Citroen C1 is built alongside its relations on the same production line. Given Citroen's usual avant-garde styling the C1's lines are fairly ordinary, the compact city car very functional in its looks. Three- and five-door versions of the C1 were offered by Citroen, though the rear windows in the five-door models pop out rather than wind down. Space isn't too bad inside, despite the C1's compact dimensions, though the useful space in the rear does mean that the boot is tiny. The interior is decently made, but being an inexpensive model the plastics aren't of the highest, tactile quality, it all feeling rather basic and functional. Still, that's kind of the point. Toyota's Aygo is arguably the most appealing of the triplets. The Citroen been around since 2005, it featuring a number of facelifts in that time, the 2009 change improving its front grille and bumpers, then 2012 seeing further style added with smarter new bumpers incorporating the double chevron Citroen badge. 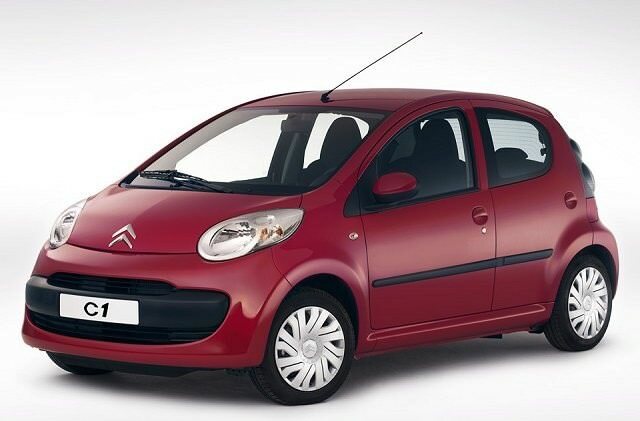 Each time the C1 has been stylistically enhanced Citroen has tweaked it technically to improve economy and emissions, though even the earliest examples sip fuel and deliver impressive CO2 ratings. Two engine choices are offered, a 1.0-litre three-cylinder petrol unit and a 1.4-litre HDi turbodiesel. It's the former that makes up the bulk of used choice, as the diesel was expensive when new - and the petrol model is more than economical enough for most buyers. Trim levels have changed throughout the C1's lengthy production run, all models coming with a fairly basic specification including anti-lock brakes and an adjustable steering wheel. The diesel engine might offer better overall fuel economy, but it's the 1.0-litre petrol car that's the best buy. It'll sip fuel, while the three-cylinder engine is rev-happy and full of character. Trim levels depend on age and budget, but don't expect to find any featuring more than the most basic of standard equipment. Citroen's C1 might be among the oldest city car offerings out there, but its enduring appeal lies in its charm and economy. Its Toyota relation might be smarter looking, but the French car still appeals as an inexpensive urban runabout.